Round-trip: - 2-3 hours (including stops). Liz fear factor: - 3/10 no problems. Chirri dog factor: - Easy peasy. Need a leg up in 'One tree gully'. Need my boots if the rock is hot but not too sharp for my pads; occasional goats and donkeys to chase. No lamp-posts or trees, but a few bushes. Dangers: - Don't get too near to the cliff edge; take care on the loose rocky bits. Pleasures: - Making a brew at the tree of 'One-tree gully'. Climbing with a full moon and watching the sun-rise from the summit, and the great views on a clear day. Wildlife and plants: - Occasional raptors seen from the summit, plenty of rock doves and larks with the occasional Hume's and Desert Wheatears. 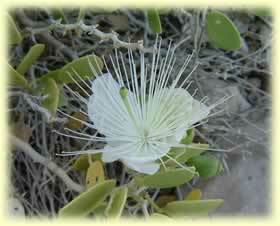 Healthy specimens of Caper plant (Capparis sinaica) in the gully, along with Fagonia bruguieri, and Moringa. Foxes seen from the summit in the valley towards Hatta. Jebel Rawdah is found to the north of the road going from the Madam roundabout in the direction of Hatta. At about 10km down from the roundabout, turn left, just before the mountain, on the black-top quarry road. Immediately take the right fork to the quarry at the first junction. Pass over the weighbridge and leave the surfaced road on a track to the left (about 4.2km from the fork), and just before the road starts to ascend to the quarry workings. Follow the deteriorating track going southeast, ignoring the tracks leading off to the left. This leads to the camping area beside the main wadi which runs parallel to the ridge on your right. There is a definite fork about 1km from the surfaced road, with tracks leading either side of a ridge coming down from the mountain. Make sure you take the track to the right, and the campsite is a short distance beyond, where the track eventually peters out. To reach the alternative campsites take the left fork at the first junction on the black-top road instead of the right, and then look for a track, at about 4.2km from the main road, leading right off the black-top which takes you round the back of the mountain, and not into the quarry valley. Keep the mountain to your right, with the gravel plain to your left, and travel southeast a further 3.7km until you see a wide valley leading southwest between the two halves of Jebel Rawdah. See the map for details. 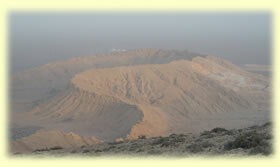 According to my map, the name Jebel Rawdah, applies to the whole mountain massif which consists of three distinct parts. The part nearest to the road has an unusual whirl-like shape, and is being actively quarried. Northeast of this is a tapering escarpment, and to the southeast of that is another whirl-shaped mountain which is part of the Rawdah massif, and joined by a ridge to the quarried peak, but is separately named Jabal al Fuad. This is the highest of the three at 692m, and the one to climb (the other two summits are about 500m). The quarried section loses a lot of its appeal due to the workings, but the escarpment has some interesting scrambling and some of the north-facing cliffs are used by rock-climbers. The attractive, distinctive shape of Jebel Rawdah makes it easy to pick out from a distance, and fortunately the scars left by the quarry operations are largely hidden from view in most directions, being in the middle of the group of peaks. The rock is sedimentary limestone with plenty of marine fossils to be found. The rock strata are tilted and curved dramatically, giving rise to the escarpments and the unusual shape. The main wadi draining the area rises on Jabal al Fu'ad and descends in a north-westerly direction passing the base of the quarry. It's quite deep and steep in places but nevertheless makes an interesting ascent or descent. There are plenty of camping places. The most sheltered spot is beyond the quarry on the banks of the wadi coming down Jabal al Fu'ad, but if the wind is blowing from the west, you may be showered with fine dust from the quarry, as well as be disturbed by the noise of the heavy machinery. Apart from that, this is a very attractive campsite with a few cleared camping spots and is a good starting point for a climb. Other options include the wide, open valley between the north-western escarpment and Jabal al Fu'ad, or below the cliffs to the north of the escarpment, as mentioned above. Since the time of writing there has been extensive quarrying on parts of the mountain away from the main quarry. The 'One-Tree Gully' route now has a rough track, part of the way up the hillside, and it is now possible to drive directly from here to the wadi campsite. This was previously blocked by a low outcrop. Despite this disfigurement, it is still possible to follow the routes up the mountain. Jabal al Fu'ad offers several straightforward routes, meaning that you can ascend by one route and descend by another, without worrying about route finding. There is the route up the main wadi, the route along the edge of the cliff, and my favourite which is by 'One-tree gully' (see diagrams and photos). All of these can be used for ascent or descent, although it's probably wise to have used 'One-tree gully' as an ascent before trying to descend that way as it involves a little bit of easy scrambling. The main wadi route is interesting for its sheer beauty, as well as its plants and wildlife. It doesn't offer much in the way of views, but you do get a lot of welcome shade if the sun is low in the sky. There are a couple of very easy scrambly bits, but the rock is clean and stable, and good fun to climb. This route starts at the campsite by the main wadi. The cliff edge route gives brilliant views in all directions which get better the higher you get, but the path slopes away to one side and is a bit loose in places so that you have to concentrate on where you put your feet. Think of this route as an ascending traverse with a steep cliff to one side and a moderate slope to the other. If you start before dawn this is a great route to see the sunrise. Unlike the other two routes there is no shade on this route and it can get a bit hot if there is no breeze. There is no scrambling involved if you start from the camp near the wadi. From there, a shallow gully leads northeast, easily taking you onto the ridge. Turn right at the ridge and follow the cliff, eventually bearing right to head for the summit. You can also get onto this route from the valley campsites at roughly the same point but from from the northeast up the steeper cliff side. The One-tree gully is only really usable if you camp at the alternative campsites near the escarpment. From these campsites look over towards Jabal al Fuad. To the left you will see the highest point of the row of cliffs on this side. The cliffs look pretty impenetrable, but just back from the lefthand end there is a small gully with a lone Moringa tree at its base. You may need binoculars to see this from the valley. If you make for this tree following the dark-rock spines leading towards the cliffs you will eventually see that the gully is easily climbed to the left of the tree. Take time to stop at the tree and perhaps make a cup of tea while admiring the views over the gravel plains and back towards the campsites. Once at the top of the gully work your way up onto the shoulder to the right and then follow this to the summit keeping the cliffs to your left. To descend, you can use a variation of the ridge route and scramble down one of the gullies in the cliffs to the right. Some of these are difficult. The further you go down the ridge the easier it gets but the further you will have to walk back to your camp. Such is life.